As we informed recently, we added a new feature to CodeTwo Email Signatures for Office 365, which allows you to preview server-side signatures while composing emails. Today, we have another great news for you – the signature preview feature is now also available for Outlook for Mac users. 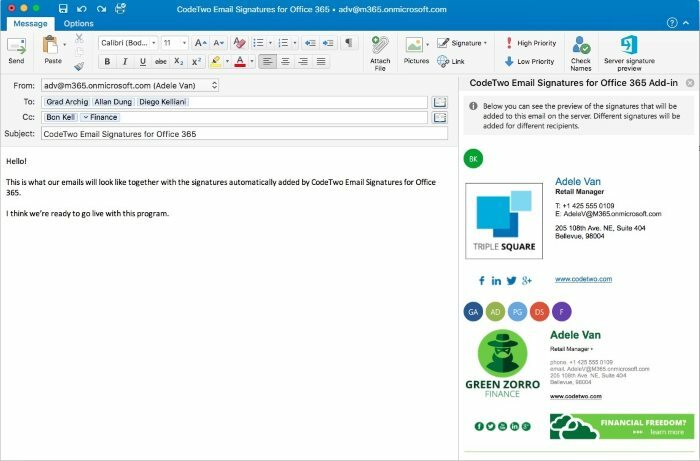 To enable email signatures preview on Outlook for Mac, you need to first deploy CodeTwo Email Signatures for Office 365 Add-in to users in Office 365. You can do it centrally for all users via the Microsoft 365 (Office 365) admin center or you can let each user install the add-in individually via OWA. Once the add-in is deployed to the Office 365 users’ accounts, it will automatically appear in Outlook for Mac, Microsoft Outlook, and Outlook on the web. To find out more on how to preview email signatures in Outlook for Mac, Microsoft Outlook and Outlook on the web, go to this user’s manual. Note: If you have the CodeTwo Email Signatures for Office 365 Add-in already deployed in your organization, you need to remove it and install it again to enable the signature preview feature for Outlook for Mac users. As always, if you have any questions, feel free to contact us. We are available 24/h, from Monday through Friday.